Additional Services such as Architectural Design, Building Permit & Expediting are available if required. 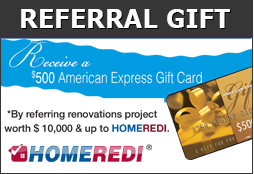 Please contact us at 1-855-SAY-REDI to schedule a visit from one of our trained estimators. HOMEREDI is a registered trademark.